Angiodysplasia is the most common vascular abnormality of the gastrointestinal tract, responsible for approximately 6% of lower GI bleeding cases and up to 8% of upper GI bleeds. It is caused by the formation of arteriovenous malformations between previously healthy blood vessels, most commonly in the caecum and ascending colon. It has a prevalence of 1-2% and is the second commonest cause of rectal bleeding in those >60yrs; it is the most common cause for bleeding from the small bowel. In this article, we shall look at the risk factors, clinical features and management of a patient with angiodysplasia. Acquired angiodysplasia – begins as reduced submucosal venous drainage in the colon due to chronic and intermittent contraction of the colon, giving rise to dilated and tortuous veins. This results in the loss of pre-capillary sphincter competency and in turn causes the formation of small arterio-venous communications characterized by a small tuft of dilated vessels. Congenital angiodysplasia – such as hereditary haemorrhagic telangectasia (/Rendu-Osler-Weber syndrome) or Heyde’s syndrome. As the AV lesions can occur throughout the GI tract, the degree of symptoms* will depend upon the location and severity of the malformation. Like most cases of GI bleeding, upper GI lesions are more likely to present as haematemesis or melena, whereas lower GI lesions (more common in angiodysplasia) are more likely to present as haematochezia. Signs on examination are usually minimal. *Elderly patients with chronic undiagnosed angiodysplasia are often anaemic, so can present with symptoms of fatigue, weakness, or dyspnoea. The major differential diagnoses for painless GI bleeding include oesophageal varices (which may present with acute lower GI bleeding if large enough volume), GI malignancies, diverticular disease, or coagulopathies. Blood tests will be usually ordered as part of the routine assessment for any patient presenting with GI bleeding, including a FBC*, U&Es, LFTs, and clotting. Depending on the clinical picture, a Group and Save or Crossmatch may be warranted if there is a potential need for transfusion. In patients presenting with symptoms of GI bleeding, it is essential to exclude any malignancy. Patients with occult angiodysplasia will likely receive an upper GI endoscopy (if medically fit) and/or colonoscopy depending on the suspected site of bleeding. 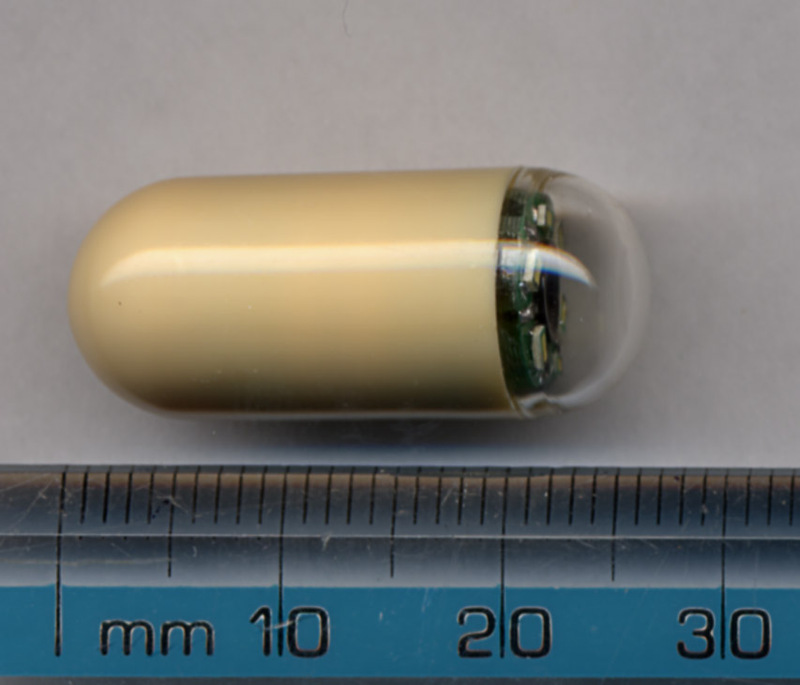 Small bowel bleeds are trickier to identify, however wireless capsule endoscopy (Fig. 2) is the preferred method (although deep small bowel enteroscopy is an alternative), with any profuse bleeding identified and stemmed via administration of therapeutic agents at endoscopy. In the setting of an overt angiodysplastic bleed, mesenteric angiography may be required to confirm the location of a lesion in order to plan for intervention as necessary. Angiography can involve either radionuclide scanning, CT scanning, or MRI scanning to image the GI tract vascular supply after the injection of a radio-opaque contrast agent into the vessels. Figure 2 – Capsule endoscopy is the preferred imaging choice for small bowel angiodysplasia. 10% of patients with angiodysplasia will present with a major GI bleed, for which patients should be managed accordingly. Risk factors associated with poor outcome include advancing age, liver disease, patient presenting in hypovolaemic shock, and current inpatients (who have almost 4 times associated mortality compared to an outpatient at presentation). Patients admitted with angiodysplasia can be treated conservatively, especially if there is only minimal limited bleeding in a haemodynamically stable patient. Bed-rest and IV fluid support, along with potential tranexamic acid, will provide sufficient management due to the self-limiting nature of the condition. This involves subjecting the bleeding vessel to electrical current and argon, acting as a safe, cost-effective, successful treatment option. 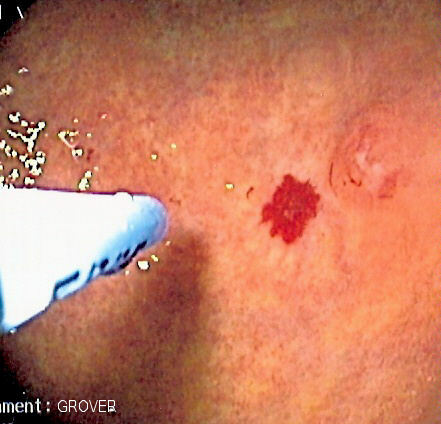 Other endoscopic techniques include monopolar electrocautery, laser photoablation, sclerotherapy, and band ligation. Mesenteric angiography – used for small bowel lesions that cannot be treated endoscopically. This procedure involves super-selective catheterisation and embolization of the vessel that has been demonstrated to be bleeding by extravasation of contrast dye into the bowel lumen from the identified angiodysplastic lesion. Mesenteric angiography may also be indicated in GI bleeding from any other location when endoscopic therapy has failed (to treat or localise) or when endoscopy is not a suitable option (for example in patients who are not fit for endoscopy). The sensitivity of angiography ranges from 58-86% and increases depending on the bleeding rate of the lesion. In a minority of cases, surgical intervention is the only option, whereby a resection and anastomosis of the affected segment of bowel is necessary to limit bleeding. Bowel resection in patients with angiodysplasia is associated with a relatively high mortality, thus should only be considered if absolutely necessary. The complications of angiodysplasia are mainly related to the treatment, as re-bleeding post-therapy is relatively common. Endoscopic techniques have a very small risk of bowel perforation, whereas mesenteric angiography carries risks of haematoma formation, arterial dissection, thrombosis and bowel ischaemia. Angiodysplasia is caused by what mechanism? What is the main artery supplying the jejunum? Which of the following is not an indication for surgical management in angiodysplasia? Sami SS et al., Aliment Pharmacol Ther.